Regulation of excessive underarm sweating. 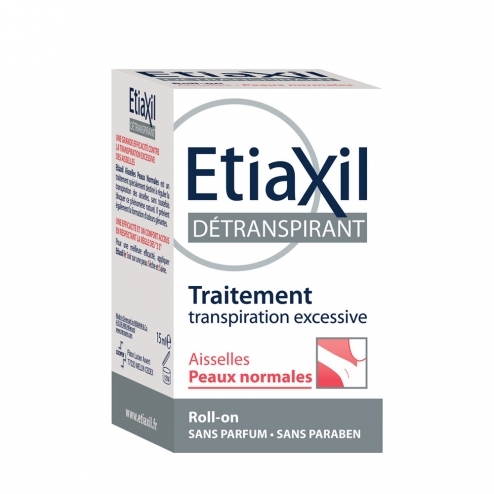 Etiaxil Oily Armpits is specially designed to control underarm sweating, but not block this natural phenomenon. This product also prevents the formation of odors. Etiaxil active element has aluminum chloride hexahydrate dissolved in alcohol, the latter allowing optimization of the action of aluminum chloride and providing antibacterial function. This association also allows officials to destroy the bad smells. Applied to the armpits to the desired frequency, the product acts directly on the sweat glands and regulates their rate of transpiration. Glands so treated, fall asleep while remaining intact. For better efficiency, use Etiaxil the evening before bed on clean skin, dry and healthy. Allow to dry naturally in air. The next day, wash the underarms with soap and water. The effectiveness of Etiaxil allows space applications. Start of treatment, use Etiaxil 2 consecutive nights per week. From the comfort level is reached, reduce the frequency of applications to suit: 1 night of 3, then 1 night at 4, then 1 night a week. Precautions: After shaving or waxing, follow 48 hours of time before applying the product. Alcohol Denat., Aluminum Chloride, Dimethicone copolyol. Fragrance free.